I have to confess that I haven't been 100% focussed on watching films this week - instead, I've been getting back into the dangerous world of methamphetamine production with seasons 3 and 4 of Breaking Bad. It's a just a shame that it's so hard to watch it in the UK. Presumably due to some sort of rights issue, only the first two seasons are available in this country, so I had to source my DVDs from the German version of the Amazon website. Nevertheless, it's a truly brilliant show, probably the most compelling television series I've seen since I watched The Wire. I think the last time I saw Jesse Eisenberg on the big screen, he was playing the mega rich founder of Facebook in The Social Network. His character in this comedy is rather less ambitious - he plays Nick, a young man who's just finished university, and is working as a pizza delivery boy to make ends meet. His rather depressing existence gets a whole lot worse when he is ambushed and knocked unconscious by two hapless, would-be criminals in monkey masks. When he comes around, he discovers that he has been fitted with a bomb vest - and that unless he robs a bank and obtains $100,000, the crooks intend to detonate it... I have to say that I was a little disappointed with this one - from watching the trailer, I expected it to be a laugh a minute, but instead, it's only sporadically amusing. The big problem here is the script, which is crude and foul-mouthed, rather like many recent Judd Apatow productions - but unlike those movies, it largely forgets to include any actual punchlines. Fortunately, the filmmakers did manage to put together a strong cast, and the likes of Aziz Ansari and Danny McBride help Jesse Eisenberg to make the most of the generally weak material that they're given to play with. Pretty forgettable, on the whole. James Wan and Leigh Whannell, the co-creators of the Saw franchise, return with another horror film - this time with a more supernatural bent. Our protagonists here are Josh and Renai Lambert and family, who have just moved into a big, old house in the suburbs of some unnamed American city. Of course, their new home turns out to be anything but welcoming, and after a few (rather dull) scenes in which things 'go bump in the night', the action really kicks into gear when their young son Dalton inexplicably falls into a coma. After the Lamberts have exhausted the help that medical science can provide to them, they decide to turn to a psychic medium for answers. She tells them that their son's spirit has come adrift from his body, and that to save him, Josh Lambert must use his own latent ability in astral projection. The next sequence, in which Josh Lambert travels through the spirit world to save his son, is genuinely frightening; he has to wade through dense mist, with ghoulish apparitions coming at him from all angles, and only the psychic's voice for guidance. It's by far the best part of a pretty uneven film, a movie which has some big shocks and jump scares but also quite a few monotonous stretches. The script is generally decent (though there are a few groan inducing lines), and Patrick Wilson and Rose Byrne are solid enough in the lead roles. In general then, this is a decent effort from Whannell and Wan, and makes for grounds for cautious optimism for their career away from the Saw franchise. 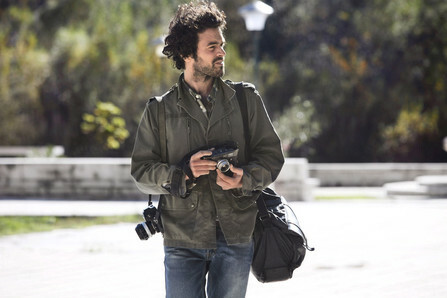 My favourite film of a pretty mediocre week, this one stars Romain Duris as Paul Exben, a frustrated Parisian lawyer. Though materially successful, he's trapped in an unhappy marriage, and has suspicions that his wife may be having an affair. He is also struggling with the feeling that he has squandered the talent in photography that he displayed as a young man to work in a more humdrum (but lucrative) profession. This situation becomes far more serious when he accidentally kills his wife's lover after a heated argument. Realising that he could be facing a murder charge, he decides to fake his own death, and escapes to Croatia, using the dead man's identity. Whilst there, he is finally able to indulge his passion for photography, but his unexpected success in that medium leads to a mounting fear that he will be exposed as a fraud. For two thirds of this film, I was completely absorbed in the fate of Paul Exben, but I was rather confounded by the ending, which (without giving away any spoilers) seemed out of place with the events leading up to it. Romain Duris puts in a fine performance in the lead role, creating a believable deterioration in his character's demeanour - from cocksure professional to paranoid runaway. He's ably assisted by the always brilliant Niels Arestup (who seems to be in almost every French film I've seen recently), playing the editor of the Croatian newspaper which buys Exben's pictures. The movie is also beautifully shot, particularly during the second half, when there are some wonderful shots of the Croatian coastline. With a different ending, I would have had no hesitation in awarding this film an '8' or a '9', but as it is, a '7' will have to suffice. I'm sure I've written quite a few times on this blog about the dangers of expecting too much of a film going in - but this is another example of a picture which has received a great deal of hype and some glowing reviews, but which ended up being 'just OK'. I suppose if I'd heard only bad things before going in, I might have been pleasantly surprised, but it ended up being a bit of a let down. Anyway, in case you've been living under a rock for the last few weeks, the background to the film is as follows: It's set in a dystopian future in which the present day United States and Mexico have been divided into twelve districts, ruled over by a the inhabitants of a huge city known as the Capital. While the residents of the Capital live in an opulent, multi-coloured garden of delights, life for denizens of the outer districts is tough, with barely enough food to go around. By way of retribution for an attempted uprising some 74 years ago, each year the twelve districts must provide a boy and girl (aged between 12 and 18), who are to take part in a televised gladiatorial contest, with only one contestant coming out alive. 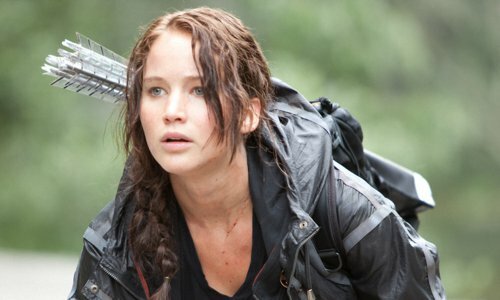 Our heroine here is Katniss Everdeen (Jennifer Lawrence) , a resourceful and courageous 17 year old from District 12, who has volunteered to be a contestant in the Games to save the life of her younger sister. She is whisked away from her life in the provinces and taken to the Capital and prepared for participation in the Hunger Games... Now, I don't want to completely slate this movie - it does have quite a bit going for it; Jennifer Lawrence is very good as Katniss Everdeen, the futuristic Capital looks suitably impressive and despite the film's nearly two and a half hour running time, director Gary Ross keeps things running at an impressive pace, so there's rarely a dull moment. However, from my point of view, there are a couple of quite major problems. Firstly, possibly because Ross is attempting to squeeze the contents of a fairly thick book into a feature length running time, we rarely get to spend much time with the other contestants in the Game. Therefore, regardless of whether those contestants are friend or foe to Katniss, their deaths rarely have much of an emotional impact on the viewer. Secondly, because the film is aimed at children, and needed to obtain a 12A certificate, it's really very squeamish about violence. Despite the central premise of the movie involving a fight to the death between a number of young gladiators, the action sequences are directed in a frenetic, shaky manner which means that we it is very difficult to clearly see the battles between the participants, or their deadly aftermath. Seeing as how The Hunger Games has just broken all sorts of box office records, I don't suppose the filmmakers will care too much what I think, but from my point of view, it's too flawed to be considered a complete success.